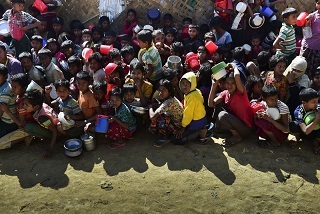 31 Rohingyas including 16 children and nine women are spending winter nights under the open sky for the third consecutive day at Rayermura under Amtali police station on the outskirts of Agartala. They are stranded between the Indian barbed wire border fencing and the border pillars demarcating India and Bangladesh as border guards of both the nations are alleging each other for pushing them to the other nation’s territory. BSF DIG, Gakulnagar sector Brajesh Kumar under whom the area comes alleged that Border Guards Bangladesh (BGB) was trying to push these Rohingyas inside India territory and it came to notice when vigil guards on January 18 evening at around 8 PM saw suspicious torchlight movement across the fencing and alerted others. “Message was also passed to the counterpart but they did not respond. In the morning they found 31 people waiting to cross but failed as because of the barbed wire fencing and alertness of the troopers,” DIG Kumar said. “Meanwhile, we found news in media where BGB claimed that these Rohingyas were pushed back from our side and so we during flag meeting demanded for conducting joint interrogation of them so that they could say from where they were pushed back and how but BGB refused,” he said. Already two flag meeting at battalion commander level took place but in vain. One more meeting is schedule on Monday which may decide the fate of these people.